As my love for vintages grows, and grows, and grows, there comes the time when my eighty-four-year-old grandma sends me home with something really special. She dug out of her old vintage trunk a bundle of large bolts of antique homespun fabrics and gave it to me with no words, but a face of trust and satisfaction. My hands touched these natural materials – cotton, linen, silk, grain sacks... The real ones. "It is a simple passage of time." These pieces are hand woven with a manual horizontal loom by my grandma and her mother. They date from the period between 1920 and 1950. My mom's childhood is full of images with the craft of home weaving; unfortunately, she, herself, has never done it. However, my mom remembers that my grandma used sunshine as a whitener of the fabrics. After washing those cotton and linen sheets, granny rubbed the fabrics with a bar of sunlight soap and started the scrubbing with a hand brush. When the washing was over, she rinsed the fabrics once, wrung them by hand and finally hung them on a clothesline or lay them on the lawn to let the sunshine help whiten them. Isn't it a green approach ?! I am wondering about how much humans and nature collaborate together to achieve a goal. I am in love with the simplicity and the aesthetics of these plain, humble colors and materials. I love the fact that these vintage fabrics have real-life pass before it. Yes! We can make something old, but can we infuse it with a history?!!
" It is a mistake to underestimate the significance of the relationships between humans and the fabrics that they make. There is very little that is not revealed about the geography, status, economy, and above all the identity of the maker or weaver of cloth; we are what wear and use cloth for. In modern, urban societies we have swapped natural or tribal costume for adherence to the commands of international fashion houses. But the need to own and wear texture, color, and pattern still results in the continuing reestablishment of our own identity. For those of us, who experiment with textiles, we are merely continuing to try and satisfy the urge to unify comfort, ornaments, pleasure, and beauty. Nothing is more fulfilling for us than to try and continue this perpetual tradition ." As you probably guess, I am extremely thankful for my grandmother's generosity. There is no better way to show my gratitude than using these wonderful fabrics in my home. I wish you a weekend full of beauty and sensibility. that is the sweetest ever!! what memories! Dear Sylvia, You made me have goosebumps along with a shiver as my heart felt all these lovely words and my eye's stared at your beautiful photo's...You have a wonderful giving Grandmother. May you enjoy all her beautiful gifts. How absolutely gorgeous, my heart was going pitter patter, pitter patter all the way through your post. To have such treasures from the one's you love must really warm your heart. I am so happy for you! The fabrics are lovely and the history behind them just amazing. I know you will lovingly make something beautiful with these treasures. Please share with us when you do!! What a blessing! That you still have your grandmother and that she has given you such wonderful family treasures! Looking so forward to seeing how you use these amazing gifts in your home! What amazing heirlooms you've been given! Your grandmother has entrusted them to your care. What a compliment to you. I loved seeing these beautiful fabrics! It's wonderful that your grandmothers made them. I can only imagine how you feel taking possession of them. I'm so happy for you! What wonderful gifts...the textiles, yes, but the sweet memories and thoughtfulness the most. What a precious gift! Pure beauty, your photos of these treasures. The greatest treasure, of course, is the bond with your Grandmother, absolutely priceless. By the way, I have started reading the "Book of Awesome"! Thank you so much again for the recommendation, I am enjoying it very much!! Oh Sylvia, these fabrics are absolutely lovely. What a treasure! I love these homespun textiles better than the fanciest silks and laces. I love your vintage fabrics, I'm sure you'll make beautiful things out of it. Oh these are magnificent, how wonderful that your Grandma entrusted these Treasures to you and passed them along! What an honor, they just don't make 'em like that anymore. I can't wait to see what you'll do with these fabrics! Your one lucky girl...how sweet, your grandma felt as it was time and she could entrust you with these treasures....enjoy. What a blessing your Grandmother bestowed on you, first with the wonderful gift of trust and secondly with the amazing stack of vintage fabrics. You have such special treasures in both gifts. You both are blessed. I am so pleased that you linked to Potpourri Friday. Your participation certainly makes the party more successful . I appreciate you, Silvia! I hope you will make this one of your regular stops each week! Thanks too for following. I checked and have been following you for a while. It wonderful to have a new friend and I do hope to get better acquainted with you. It had been so long since I had seen a post from you! Thank you for coming by today. This first week back has been very exhausting and I am so tired. I don't know how I am going to manage to write a post tonight, but I so love to write. Your photos are UNBELIEVABLY beautiful. Texture, color, choice of patterns certainly show the culture and status of the creators....art is what makes us ALIVE!!!! What history. What stories the cloth must tell! A priceless gift. What beautiful fabric.... would love to see what you do with them!!! I am now playing catch up after our extended hols, visiting my favourite blogs, this one is so special, to be given such glorious fabrics in the first place is a joy, for those fabrics to have been woven by your family is beyond bliss. You are incredibly lucky, but then I suspect that you know that. 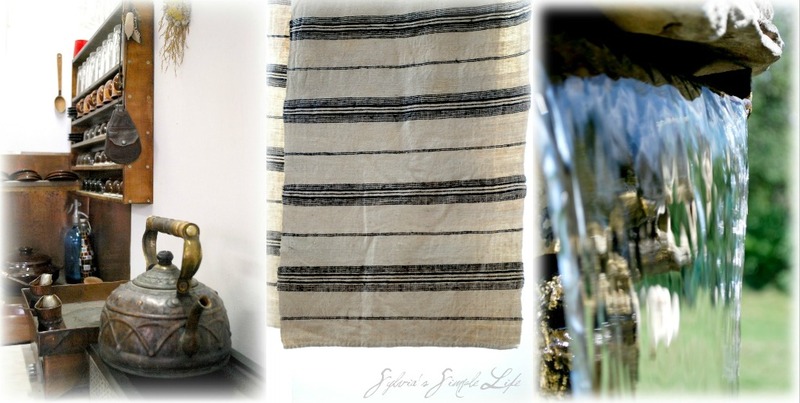 I am sure you will put the linen to good use and make some precious objects that will become family heirlooms. Lucky lucky lady. What a treasure your Grandma has passed down to you, Sylvia! I cannot wait to see what you create! 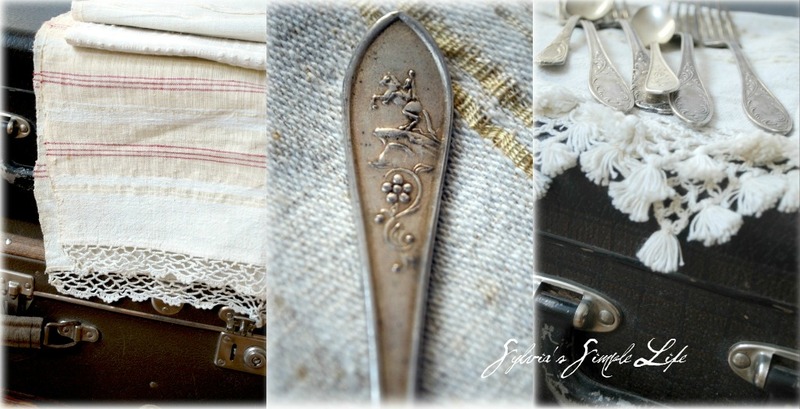 Beautiful post...so sweet that your grandmother gave them to you...they are a true treasure! thank you grandma! what gorgeous fabrics and the history behind them too! and i love that spoon of yours as well. Your textiles are amazing. What treasures to keep and yes, I would use them too. What a neat idea to create some more. Thank you for joining me at Home Sweet Home! Your've been feature at 2805's Potpourri Friday Party! I just came over from Honey at 2805--these are so beautiful--and to think that they were handwoven--this is purely amazing and they are gorgeous!!! What a wonderful heritage--I just keep looking at them in amazement and they look so gorgeous in your home...what true treasures!! I think my mind just went numb. All I could think of when I saw your treasures was "oooooooooooooo"
Not only are the fabrics gorgeous but the fact they were made by your grandmother is priceless. Certainly they will be cherished. I can see they are in good hands. These are absolutely beautiful!! How sweet of your grandmother to pass these down to you for you to treasure and enjoy. I just discovered your site and your fabrics are just beautiful. 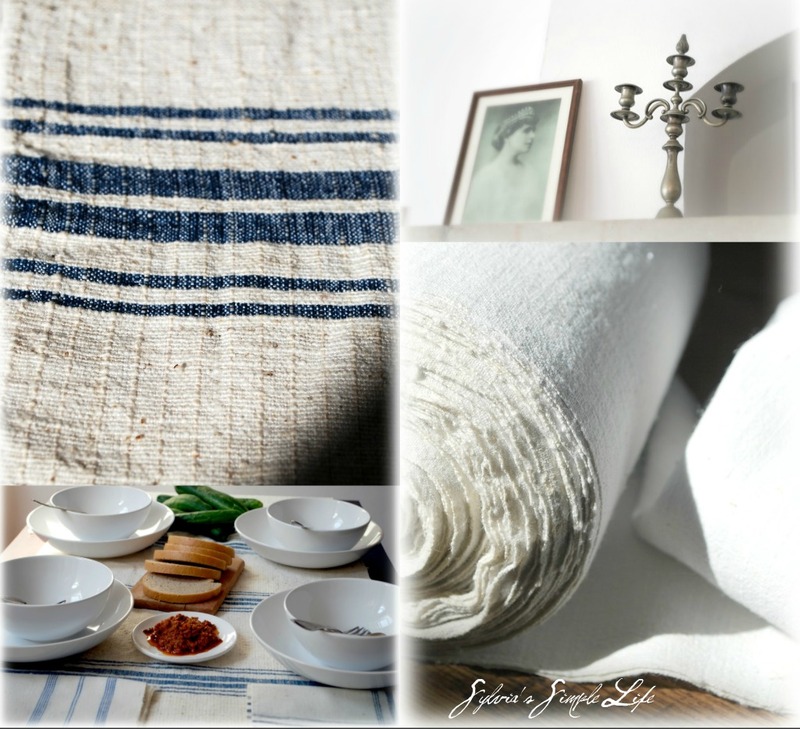 My husband and I spend a lot of time in Provence and one of my favorite things to do is shop in the village boutiques for beautiful linens to bring back to London with us. Your linen napkins look easily as delicate and authentic as any we have seen there. The fact that they were passed down from your grandmother just makes them priceless. Oh these are just lovely! A wonderful gift indeed! I could absolutely "feel" the textiles as I looked at your photos. I have some linen yardage from my great-grandparents that was brought from Germany in the mid to late 1800's. I treasure the feel of the fabric. Lucky you for having so much!